In late spring, the trees in Stanley Park come alive with new life. As leaves emerge from their buds, insect activity rebounds from winter torpor. 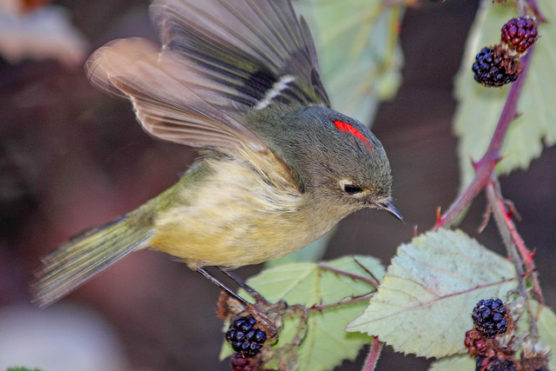 Following these insects are the birds – swallows swoop at insects just above the surface of Beaver Lake, while ruby-crowned kinglets hang upside down to pluck larvae from the tips of branches. 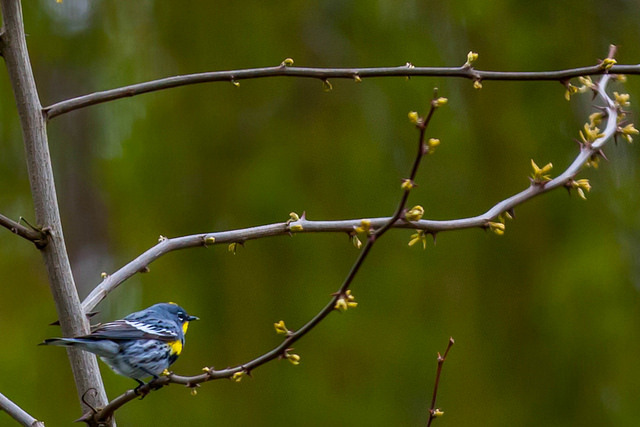 Among the most colourful of Stanley Park’s early migrants are the yellow-rumped warblers. While a few hardy individuals overwinter in our region each year, most follow their internal compass south to Mexico every fall. When days become longer, yellow-rumped warblers make the long trek back to our region, where they are one of the first spring migrants to arrive. The warblers travel by night, covering up to 800 km before the sun rises and they must stop to refuel. Many of the yellow-rumped warblers in Stanley Park are merely passing through, stopping to replenish their energy stores before continuing their journeys northwards to the farthest reaches of the Yukon and Alaska. Stanley Park is an oasis for migrants who find themselves above the city when day breaks, appearing from the sky as an island of green among the urban landscape. Next time you find yourself in forest edge habitat, keep an eye out for yellow-rumped warblers flitting amongst the treetops and flying out to catch insects in midair – the beaver lodge at Beaver Lake is a reliable place to find them. With close views, check the throat colour: two types of yellow-rumps can be seen in Stanley Park, the yellow-throated Audubon’s and the white-throated myrtle. These two forms dance along the edges of the definition of a species, and recent genetic evidence suggests that they may be quite distinct. Together, these warblers add a small piece to the diversity of Stanley Park. By August, the warblers will be nesting up north, but you can learn about all the other species in Stanley Park and our region during the Vancouver International Bird Festival (VIBF) running concurrently with the prestigious International Ornithological Congress – August 19 – 26, 2018! Check out the amazing calendar of “all things bird” on the VIBF webpage and be sure to register for events early!